Brain Jam ((c) Brain Jam Publications is a great solitaire game, similar to FreeCell except you must place cards on the same suit (and not on a card of the opposite colour as in FreeCell). It is a little bit harder to play than FreeCell, but this makes the game a lot more interesting. 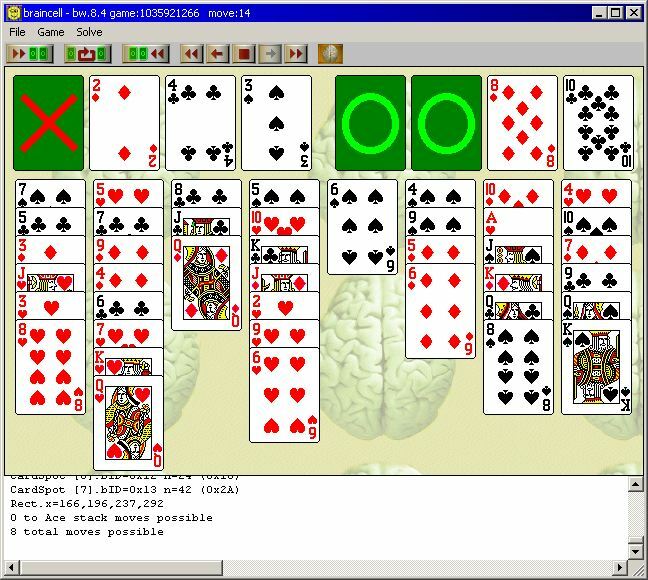 About 75% of the games is solvable (for FreeCell this is 99.997%). A Brute Force Attack on Brain Jam. It was thought that it solving Brain Jam with a computer program was too hard, and that a brute force attack would require days of computing time. My Brain Jam assistant proves that with some programming tricks every Brain Jam game can be solved or be proven unsolvable. Proving a game unsolvable is very fast, in general this takes less than 2 seconds on a fast pc. Average time to find the best solution for the solvable games is 10-30 seconds, although about 5% of the games take more than a few minutes and less then 0.4% take longer than an hour (longest is game 171 which took 52 hours). It should run on all 32bits versions of windows from Windows 95 on, and you get a connect-4 program as well for free! BrainCell ... the BrainJam clone .... it's almost finished but I am waiting for a little bit more inspiration to complete it.